An ongoing argument for iPad implementation is its role on increasing student engagement. That was certainly the case Brett Wilfred made in this Madison.Com piece. At Sandburg, teachers see an increase in engagement among the students, including increased attendance rates and a decrease in discipline reports — all attributable to the iPad, according to Wilfrid. While Schenk was certainly no 1 to 1 school, it did have two iPad carts in circulation the past two years. One cart was set aside for teacher checkout in which a teacher could checkout an iPad for the school year. The other cart was set aside for classroom use and was only checked out as a unit - the whole cart. There are examples of the iPads increasing student engagement the past few years. One app we had on the classroom cart was Star Fall and its use of music and rhythm increased students engagement or motivation in traditional literacy activities. Another app that is worthy of mention is Super Duper Story Maker that integrated stickers, drawing, writing, and audio for a student creation. I used both of these with a First Grade classroom and the students were highly motivated in the learning activities. Another project I worked on with another teacher was student created claymation videos. This particular class typically struggled with staying on task, but was very much in the zone with this activity. They worked on this activity most of the morning which included creating a frame, snapping photos frame by frame (50 + frames), and then putting it together in a small clip. In addition to the video capture app, the student's Google Drive account was used to upload and share their final project. The finished claymation project (with teacher's help) was shared at a Friendship Assembly for the entire school. While these examples definately demonstrate a level of learning engagement that may not exist without the iPad, they were rather atypical. The most common use of the iPads in the classroom was the service IXL. IXL is a service that that allows students to practice literacy and math skills, logs their interaction on the site, and presents that data in a teacher friendly manner with graphs of learner progress. The second most common use was for "free choice". While neither of these are bad uses of the iPad per se, their dominant use certainly limited the "potential" of the iPads. The teacher iPads were used in a variety of ways throughout the school. Most were used by the teachers themselves in which a common use was as a timer for testing. 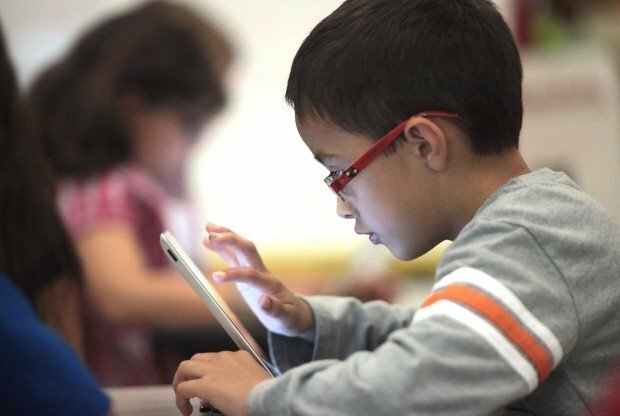 Those teachers who did use the iPads with students, typically used them as a free choice or reward for postive school behaviour. Rather than one of the educational programs on the iPads, the more typical scenario was a student playing Mind Craft or Angry Birds. Do iPads increase student engagement. Maybe, but there is a large gap between what iPads have the potential of and what actually happens when they are used in school. The more typical uses of the iPad were as timers, Angry Birds, Mind Craft, and free choice. This even as I spent considerable time installing or suggesting apps that could increase engagment in learning activities. The well constructed narrative of MMSD's tech plan was iPads as the poster child and increased student engagment the end result of implementing the tech plan. They relied on a body of research about the iPad's potential for student engagement, whereas, in my experience at Schenk I was confonted with the pragmatism of its actual use by teachers themselves.